In the Caracol of Resistance and Rebellion for Humanity, The Good Government Board of the "Central Heart Before the World," Oventik, Chiapas, Mexico, Planet Earth. 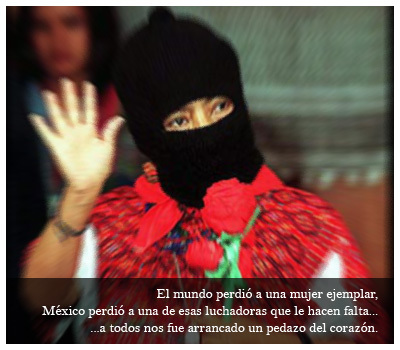 Welcome to our educational, rebel and autonomous website that is also a place of resistance of the Zapatista people, where we are building our educational projects for the autonomy of the Zapatista people. The General Coordination of the Zapatista Rebel Autonomous Education System of National Liberation of the Highlands of Chiapas (CGSERAZLN), welcomes the many organizations of different countries of the world and those who have become and continue to be brothers and sisters in solidarity with the struggle of the indigenous Zapatista peoples. We are building autonomy based on our necessities. 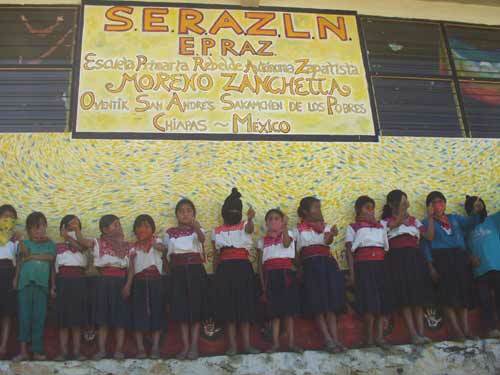 One of these is the autonomous education of indigenous and non-indigenous peoples of all of Mexico and the world. As you enter our website let us shout together some slogans and share as educational revolutionaries the happiness and harmony of being and understanding: EDUCATION IN RESISTANCE, THIS IS OUR SCIENCE!! NOT HAVING EDUCATION IS LIKE BEING DEAD!! EDUCATION CANNOT BE DETACHED FROM THE STRUGGLES OF THE PEOPLE OF PLANET EARTH!! All national and international brothers and sisters who stand in solidarity with education are invited to visit and receive more information from Caracol II "Resistance and Rebellion for Humanity" from the Good Government Board and the General Coordination of the Zapatista Rebel Autonomous Education System of National Liberation of the Highlands of Chiapas. We will be happy to let you know about the needs of our education so that you, too, can join in solidarity with the boys and girls, men and women of the peoples in resistance.